This is all well-established and relatively ancient history now, but it feels fresh and raw again with the benefit of some distance. Yes, the good Mariners were clearly overachieving. But in the middle of June, they stood at 46-25, 11 games ahead of the eventual wild-card A’s. The Mariners were going to snap the drought, because their lead in the race was virtually regression-proof. Then the Mariners regressed. The A’s, meanwhile, never lost again. The drought lives. You wonder how things would be different today had the Mariners won a few extra ballgames. Had the A’s lost a few extra ballgames. Odds are, the Mariners still would’ve lost to the Yankees, but even getting that far would’ve meant something. Alas, a promising season turned out bad, and now the Mariners are in the news. They’re in the news because they might try to get worse. Pick a source. According to Jeff Passan, the Mariners are open to blowing it up. And according to Mariners beat writer Ryan Divish, there is indeed talk of at least a partial sale. Call it a reload, if you want to. It’s looking increasingly certain the Mariners will trade away at least one good player. There’s the opportunity for them to trade away several. While it might seem foolhardy to subtract from a team that just finished 89-73, the Mariners are coming to terms with the reality of their position. And the market itself could select their direction for them. The circumstances point toward a sale. Let’s talk first about those 89 wins. Wins in isolation are good, but of course, what matters more are wins in context. With 89 wins, the Mariners still wound up eight games out of a playoff spot. They had the seventh-most wins in the American League. If you switch over to BaseRuns, the Mariners wound up 15 games out of a playoff spot. They tied for the seventh-most wins in the American League. And while obviously the current 2019 projected standings are missing a ton of information — namely, all the transactions of the next several months — the Mariners are projected for the eighth-most wins in the American League. They’re projected ten wins behind the Yankees, who project for the fourth-best AL record. The Yankees are only going to get stronger. The Mariners have limited money and the game’s worst farm system. It’s one of the worst farm systems in recent memory. The Mariners are stuck in the middle. They’re too good to be lousy, but they’re nowhere close to the best teams in the league. I assume that they know that. Help doesn’t appear to be on the way. Nelson Cruz is currently a free agent. 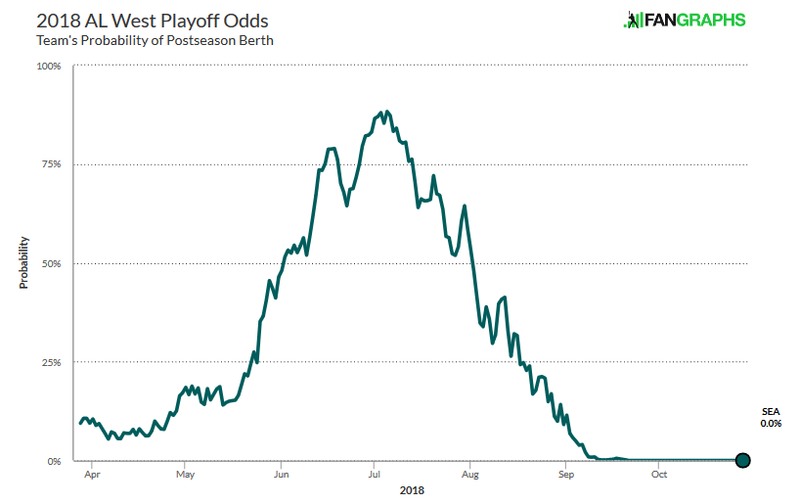 As 2018 showed, the Mariners can hang around provided they get lucky, but good luck is nothing to bank on, and besides, it caught up with the team in the end. Maybe the Mariners can fluke into the next Max Muncy. That would help. Every single team could say the same thing. Luck is random. Teams are lucky to get lucky, and the Mariners need to understand where they are. They can keep trying, God bless ’em. The Jerry Dipoto model is generally to keep trying. There’s reason to believe Mariners ownership doesn’t have an appetite for blowing it up. But there’s still more context to talk about here. The Mariners don’t have a bad baseball team. They’re not the Orioles, or the Royals, or the Tigers. Yet the Mariners don’t have a strong baseball team. It’s hard to see how they could have a strong baseball team in 2019 following a course of action that isn’t somehow dependent on good luck. And if you look at the other bad baseball teams around, you notice they don’t have much more selling to do. The sellers, for the most part, have already sold. The Mariners could almost take the trade market over. The Marlins will, at some point, trade J.T. Realmuto, who might be the best catcher in the game. The Diamondbacks will at least entertain thoughts of trading Paul Goldschmidt. Take a look at the Mariners, though. They have a whole roster, but in terms of trade value, the big three would be Mitch Haniger, James Paxton, and Edwin Diaz. Haniger has another four years of team control. Paxton has two. Diaz has four. Would there be a better outfielder on the trade market? Would there be a better starting pitcher on the trade market? Would there be a better relief pitcher on the trade market? The trade market might include, say, Nicholas Castellanos, or Billy Hamilton. Wil Myers and Kevin Pillar might conceivably be out there. Among starters, you’ve perhaps got Michael Fulmer, and Dan Straily, and the upside of Marcus Stroman. Maybe Zack Greinke and his giant contract are put on the block. Dylan Bundy could be gettable. There are interesting relievers, like Kirby Yates, and Craig Stammen, and possibly Jose Leclerc. Teams have long been interested in Mychal Givens. Haniger, though, is cheap, and not yet 28, and since he debuted three years ago he’s posted a 130 wRC+, putting him around guys like Khris Davis, George Springer, and Edwin Encarnacion. Haniger’s a corner outfielder, but he’s center-field capable. Over the past three years, as a starter, Paxton has run a K-BB% like those posted by Carlos Carrasco, Jacob deGrom, and Luis Severino. Over the past three years, as a reliever, Diaz has run a K-BB% like those posed by Dellin Betances, Craig Kimbrel, and Aroldis Chapman. To put it another way, and to simplify, here are a bunch of percentiles for Haniger, Paxton, and Diaz. These are based just on regular WAR, and all the numbers are calculated on a rate basis. You see 2016-2018 percentile ranks, 2018 percentile ranks, and projected 2019 percentile ranks, based on Steamer. Haniger is a solidly above-average everyday player. He might not have Christian Yelich-level upside, but you can think of him a little like how you thought of Adam Eaton a few years back. Paxton is someone whose health is the only thing that’s held him back from being widely recognized as an ace. The performance is there, and he’s a hard-throwing, strike-throwing lefty who hasn’t had a major elbow problem. He just made a career-high 28 starts. Diaz is one of the most dominant one-inning pitchers in the world. He just struck out 44% of his opponents. It was the second time in three years he’s cleared 40%. Edwin Diaz is a living, breathing absurdity. If the Mariners want to own the trade market, they could have the top outfielder available, the top starter available, and the top reliever available. There is, of course, the other market — the free-agent market — but even there, the picture doesn’t change much, especially when you factor in cost. Free agents get free-agent money. The Mariners’ big three are still in their team-control years. And even including free agents, there’s not a free-agent reliever better than Diaz. There’s probably not a free-agent starter better than Paxton. That depends on what you think of Patrick Corbin. Corbin might make $100 million over the next five years. Paxton might make, say, $20 million over the next two. That’s not all the Mariners could think about. Mike Zunino has two more years of team control, and there are already rumors linking him to the Rays. Jean Segura is signed to a modest long-term contract, and he has a no-trade clause, but those get waived every year. I imagine Segura wouldn’t mind getting away from the Mariners if the Mariners were to choose to rebuild. In theory, the Mariners could move the cost-controlled Marco Gonzales. Perhaps someone out there is still interested in Dee Gordon. The Mariners have more players with positive trade value than just the main three. But the main three have major, major trade value, especially in this present market. They’re excellent players who would be affordable under any existing big-league budget. They all have multiple years of team control left, and the other sellers just can’t offer much in the way of competition. It’s going to be up to the Mariners to decide how far they want to take this, because there’s going to be plenty of interest. There are going to be compelling proposals for multiple players. If I had to guess, the Mariners won’t completely blow it up. I don’t think ownership wants to go in that direction. Of the big three, only Paxton is likely to leave. The Mariners will want something like the Chris Archer package. The Gerrit Cole package is a much better comp. For Cole, the Pirates got a potential long-term starter, a potential long-term third baseman, and a potential long-term reliever. They also got an outfield prospect, but the bulk of the return was lower-ceiling, and major-league ready. If the Mariners did something like that with Paxton, they could try to tread water in the meantime while saying they’re also improving the future. It’s pretty easy to see the Mariners deciding to move Paxton. They can see the market, and they know where they are. Beyond Paxton, it gets more complicated. If the Mariners want to build up the farm in a meaningful way, the option will be there to trade Haniger and Diaz. But it’s never that easy to kick off a rebuild. Not when you’re still just months removed from almost tasting a playoff berth. This’ll be a test of the Mariners’ willingness to give up. They’ve been bad before, but seldom on purpose. We hoped you liked reading The Mariners Can Fill the Seller Void by Jeff Sullivan! The Cleveland Browns have been to the playoffs more recently than the Mariners. I died a little just typing that. The Seattle SuperSonics have been to the playoffs more recently than the Seattle Mariners.